What if web surfers don't get to see the whole screen? The contents of a screen are chosen and its layout defined in order to distribute the contents on a page with a cosmetic overlay being added to put the finishing touches to the screen. Throughout the creative process, the designers working on the project are concerned with every element on the screen: every zone, every text, every colour has a meaning. But what happens when an actual user goes on screen for the first time with a specific task in mind that he wants to carry out? The emotional side of his brain is going to filter the information on the basis of summarised information captured in his peripheral vision with the objects on the screen having the most chance of satisfying his expectations, what is known as the process of attentional orientation. The emotional side of his brain then informs the cortex about the interesting options to be analysed in detail. Thus the brain will direct the eyes towards the objects filtered as interesting in order to analyse the contents of these zones. To sum up, while all the objects on the screen have been “viewed” by the brain, only a few of them will have the chance of being “examined” in detail. But how do we know what objects are going to draw the user’s attention? It is important to know that this attention is progressive with the brain directing the eyes to look for information on the basis of what has already been analysed and memorised by the user on screen. If a user goes on screen for the first time, his attention will not be the same as the attention of a user who has already visited the screen previously. In the first case, as the user examines the screen, his attention is guided by visual elements. The newpharma.be website is a site for selling medicines on line. By using Gweezy, an SAAS accessible on line tool, you can see the zones that are going to draw the user’s attention within the first few seconds. After having downloaded the page in Gweezy with the aid of a plug-in, the user can identify the zones that he wishes to analyse. In this case, he would like to know if using the main navigation tool with the text “What are you looking for?” and an ad will draw the user’s attention. He then uses the “Primary Impact” tool, a highlight simulation tool, which enables him to identify the zones that users are likely to see in the first few seconds of their visit. It can be clearly seen that the question “What are you looking for?” is very prominent in the three zones. It will definitely draw the user’s attention while the main navigation and ad are hardly prominent. He can then add the zones and continue the screen analysis. He adds the “All categories” title of the section to the zone to be analysed. So the zones that attract the most attention will then be “What are you looking for?” and “All categories”. To know if this is suitable for conversion, you have to know what the main tasks are that users would like to carry out on this type of website and if “What are you looking for?” and “All categories” are the correct zones for analysis. 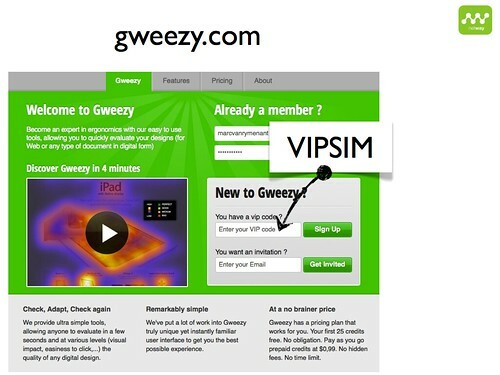 If you would like to try out Gweezy, please try the code VIPSIM which will give you access to the toolbox to carry out your own tests. Gweezy started as an internal project at Netway (specialists in user experience for the last 15 years with knowledge of state-of-the-art techniques used in optimising the interface and the creative process using behavioural methodology, eye-tracking, neuro-imagery). In 2005, the company used it to enhance the efficiency of its own team. The tools are based on mixed algorithms with actual user test data utilised by Netway in recent years.